HOA Pond Cleaning | GeoForm International Inc.
Waterways such as ponds, lakes and streams are often found in or around residential complexes such as subdivisions, neighborhoods and condominium and townhouse developments. In many cases, a homeowners’ association is responsible for maintaining the cleanliness and environmental compliance of these waterbodies. 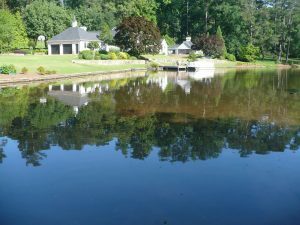 Dredging, the process of removing sediment and other debris from a water body, can play a valuable role in the homeowners’ association pond maintenance efforts. Sediment removal via dredging offers many benefits for a homeowners’ association and the residents of the community. In addition to enhancing cleanliness and environmental sustainability, sediment removal enables ships and boats to navigate freely through the waterbody. This is critical if the community experiences heavy boat traffic. Dredging can also assist in the development of the infrastructure that supports the community such as bridges and roadways. And well-maintained waterbodies have a positive financial impact by increasing property values. GeoForm International is pleased to offer the Dino6, a state-of-the-art sediment removal system that can serve as a compact, maneuverable HOA pond cleaner. The lightweight, yet rugged Dino6 is also easy to operate, which simplifies the cleaning process. Contact us for more information and a free quote today.